Were the parents of Cory Phast Lane car enthusiasts, Phish fans, or both? Would they have made a different choice had they known their son would one day be arrested for reckless driving? If Tupac Isme is him, then who am I? And if Tupac is alive, then is his first round opponent, Charleszetta Waddles (1912-2001), alive too? Is Notre Dame running back C’Bo Flemister’s given name, C’Borius, even better than his shortened one? Does it take a Smart Chibuzo to make sense of Trump’s amendments to the tax code? Is it better to itemize your earnings or just declare General Booty? When speaking to Australian homicide detective Pixie Fuhrmeister—who recently worked a case in which human remains were discovered inside a “wheelie bin” at a Melbourne storage facility—should you withhold nothing? Does the NOTY High Committee need to file a Form 8300 if sports-law podcaster Cash Kinghorn gets more than 10,000 votes? Will Syndronica Redd be in the black this year? Pursuant to 26 U.S.C. 7212, it is a felony to interfere with the collection of NOTY ballots, so don’t let anyone stop you from voting. 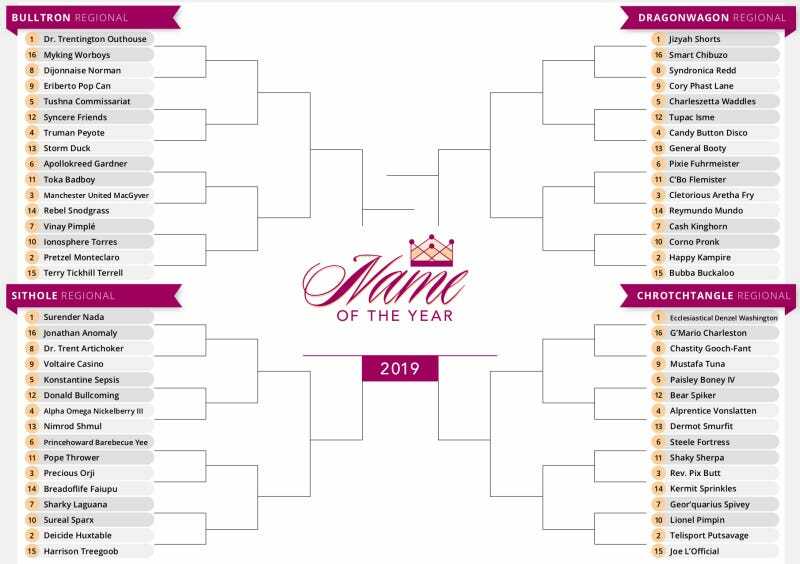 Do that below, follow us on Twitter, and submit candidates for NOTY 2020 at nameoftheyear@gmail.com.